The average kitchen accumulates 4 gallons of grease per year, so it's incredibly important to have good ventilation. Proper ventilation clears the air of smoke and odors and prevents particles from accumulating on ledges, curtains and cabinets. The quick answer is that they're better than nothing. Downdrafts have great CFM (cubic feet moved per minute). Unlike hoods, however, downdrafts have no capture area, so they cannot handle a vast quantity of smoke or heat. For this reason, downdrafts cannot handle professional ranges. 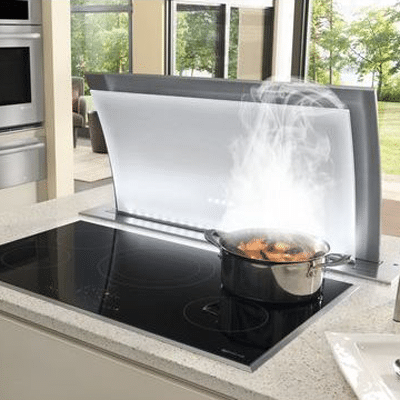 Downdraft venting is primarily used in kitchen islands or peninsulas — places where a traditional hood might be difficult to install or where you don’t want to block the view. Downdrafts typically can rise above a cooktop anywhere from 8-19 inches and can have blower motors which can be internal (placed under the counter), in-line (placed in between the riser and the outdoor vent) or remote (motor is on the outside). These motors can vary from 200 CFM to 1600 CFM depending on the manufacturer. Thermador is the original downdraft company and rises 14 inches to cover large pots. It is the only downdraft with a recirculating option. With a 14" intake the UCVM rises well above even the tallest pans. This protects against splatters when cooking and provides better performance in capturing steam and smoke - even from the front burners. Full-face filters combine a filter with a splatter shield in one easy-to-remove, dishwasher-safe element. These filters maximize grease capture without affecting airflow. Jenn-Air imports their downdraft from Italy. It is a beautiful, stylish piece, but is also over $7,000. 19-Inch Rise - Hood rises a full 19 inches to effectively ventilate cooking vapors from all types of cookware -- from shallow sauté pans to tall stockpots. 1,200-CFM High-Performance Blower (Sold Separately) - Provides exceptionally powerful ventilation that's designed to accommodate high heat from every type of cook top and capture even the most persistent cooking odors. Dishwasher-Safe Aluminum Mesh Filters, with Stainless Steel Frame - Easy-to-clean filters that maintain optimal ventilation performance by keeping ductwork clean. Magnetic Filter Lock - A strong magnetic fastener that helps ensure optimal performance and quiet operation by locking the filter tightly against the seal. Ambient LED Lighting - Elegant white lighting behind a translucent sheet of curved glass adds an alluring touch of refinement to your kitchen. Three Exhaust Positions - Versatile ducting options (left, right or bottom) that help ensure optimal installation of the ventilation system. Concealed Controls - Concealed yet easily accessible, these controls maintain the hood's elegant aesthetic. Remote Control - Offers ease and convenience by enabling you to control all ventilation functions from a distance. Infinite-Speed Blower Control - The ultra-quiet blower allows you to dial in the precise airflow needed. Cleans Your Air Quietly - The strong, powerful performance of this 1600 CFM system matches your cook top’s output and aromas vanish into thin air. Slim Style - Designed to work in perfect harmony with your 36" gas or electric cook top. Stainless Steel Filters - Dishwasher-safe for easy cleaning. 10" High Intake Vent - When activated, the downdraft rises 10" to capture even the most stubborn cooking odors. Duct properly. Use bigger duct, so the air flows freely. Always use metal, not plastic duct. 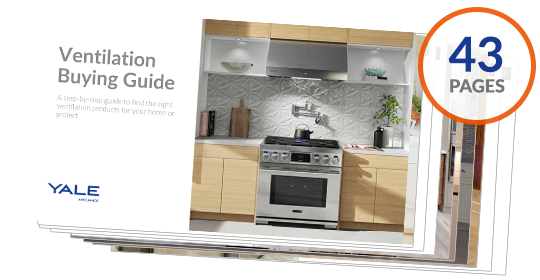 Download the Yale Ventilation Buyers Guide with features, specs and inside tips on how to plan for any type of hood. Over 100,000 people have read a Yale Hood.